There’s just something wonderful about the way morning light hits things like azaleas and camellias and everything else. It’s kind of like fairy dust, don’t you think? 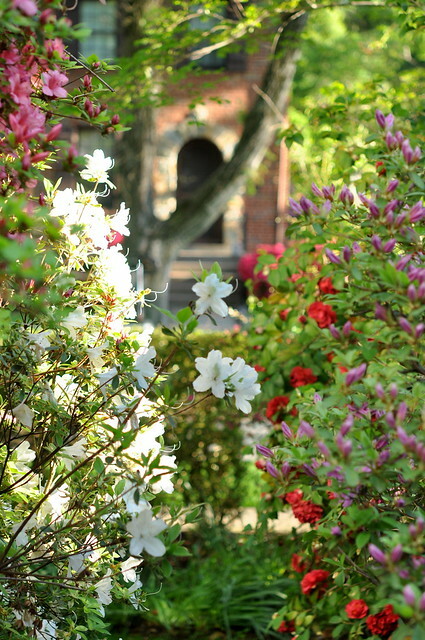 This entry was posted in photography and tagged azaleas, camellias, stone doorway, sunlight, tree trunk. Bookmark the permalink. Very pretty. Our morning light was a little wet, rain. Still I enjoy the warmer weather and the activity of the birds. We’re having another perfect day here. Three in a row–a record! Thanks, Caroline. Other people have said that too. I think it’s the stone and brick doorway in the background–it’s kind of castle-like. This picture is so lovely it’s like breathing in sunshine! Oh Ms. Pearl this is just lovely! This would be amazing framed! Morning light has always been a favourite ‘capture’ time for me … you’ve done it so beautifully here! I’ve been whining for weeks that spring is so late up here. Did get to the cottage this weekend, finally. The water pump was still frozen in a block of ice but we just couldn’t wait a day longer to be there. It was -3 celsius next morning light and the strangest thing … usually as the sun rises, it warms the air and the air moves across the lake creating ripples. The morning I took this shot, (http://jpgmag.com/photos/3001507) the air didn’t budge. It was full light at 6 A.M. and the lake held onto the pre-sun mirror quality. Wow … a strange first! I really need to shoot in the morning more…. Cheryl, your shot is gorgeous!! I used to prefer late afternoon, early evening light and then I became a cottager! Nothing in the world can compare to the sense of ‘all is right with the world’ like a thermos of hot coffee at the end of the dock, camera ready, dog snoring under the chair and the lake showing off!